Available in Polyester (as shown) and 100% Cotton Baseball Pillows. 16 inch by 16 inch (as shown), 20 inch by 20 inch, smaller accent baseball pillows. We even have body pillows that we can design for you. We also design round baseball pillows. Scroll down to see more. Call Linda or Rod to create a great baseball gifts for players, fans and baseball lovers gifts. Personalized Vintage Baseball Throw Pillows for Guys. Personalized Vintage Baseball Throw Pillows for Guys, makes the perfect baseball gift. One of our Top Selling Design. Guys love the rustic man cave baseball pillow design. Type in your Jersey Number or Monogram or Delete the Text. Personalized Vintage Baseball Throw Pillows for Guys for boys and men, the perfect Baseball gifts. Call Linda or Rod to put this cool vintage baseball design on any of our hundreds of Zazzle quality personalized gifts. Thank you for helping make the above Baseball Throw Pillow our BEST SELLER. People love this design on watches, blankets, clocks and more. They will really love one of these vintage baseball baby gifts, makes the perfect Baseball gifts idea. Call us and we can place this cool rustic looking vintage baseball design on any of our hundreds of gifts. Personalized Vintage Baseball Throw Pillows for Guys, makes the perfect Baseball Gifts for that special individual. Call Linda or Rodney at: 239-949-9090. SCROLL DOWN for More Vintage Baseball Decorating Ideas: Baseball Blankets, Pillows and more. Some of the coolest vintage baseball pillows gift, makes the perfect Christmas Gift. Some of the neatest baseball fleece blanket or other vintage baseball man cave ideas and baseball bedding. The players and the coach will enjoy one of these Baseball Team Gifts and Senior Night Baseball Gifts for Players and Coaches. Type His Text in the text boxes on the product page. We can place Any of our designs on ANY Zazzle merchandise. No extra cost for custom orders at affordable prices. Every design or part of every one of our designs can go on any of the hundreds of Zazzle products including but not limited to, Personalized Decor, Device Cases, Kitchen supplies, tons of Party stuff, postage stamps, invitations, posters, plates and napkins, to name only a few. Personalized Vintage Baseball Throw Pillows for Guys. Some of the coolest Customized Personalized Baseball Throw Pillows make really cool accents for a baseball man cave or decorating ideas for baseball bedrooms, makes the perfect baseball gift for any occasion. All baseball pillows are available in Grade A 100% Cotton Pillows or the less expensive Polyester, as shown. Polyester Baseball Throw Pillows are my most popular. Maybe because that is the fabric, I place the designs on because they are less expensive than the 100% Cotton Baseball Pillow. The Pillows are Square, regular size baseball throw pillows and larger along with Lumbar styled vintage grunge baseball pillows. Personalized Vintage Baseball Throw Pillows for Guys, the perfect Baseball gift. Square pillows are available in 16 x 16 inch and 20 x 20 inch large baseball throw pillows and the lumbar baseball pillow. Polyester or 100% cotton. I can even create a baseball body pillow for you. He will love one of these Personalized Vintage Baseball Throw Pillows for Guys, makes the perfect Baseball gift. Old faux Vintage Baseball Pillows have an almost fossil a stone-looking appearance. See more Vintage Bedroom Decorating Ideas below. Really cool and great gifts for birthdays, Valentine’s day or any special occasion. Enjoy these Personalized Vintage Baseball Throw Pillows for Guys. 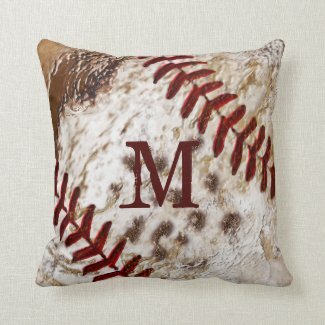 Personalized Vintage Baseball Throw Pillows for Guys, makes the perfect Baseball gifts for that very special person. Vintage baseball blanket and throw baseball pillows, make it very special. Baseball gifts idea for any occasion, it will create a super cool vintage baseball room. Baseball gifts with Vintage Baseball Decorating Ideas with rustic Jersey Number and close up baseball stitching that is beveled and darken with aged look. Personalized Vintage Baseball Throw Pillows for Guys, makes the perfect Baseball Gifts. Warm and cozy light weight baseball throw blanket that matches the vintage baseball throw pillows above for players or fan. See a few vintage baseball decorating ideas and good colors for vintage baseball decor below. 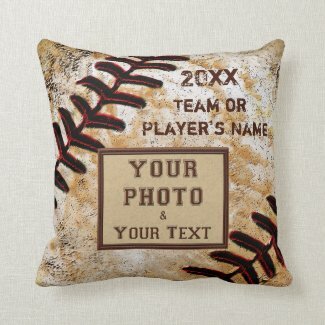 Personalized Vintage Baseball Throw Pillows For Guys, makes the perfect Decorating idea. This vintage baseball blanket was recently purchased as a gift to be given to a PROFESSIONAL BASEBALL Player. It is so exciting to know that a pro will be enjoying our original dirty baseball blanket with this cool vintage look design. It will be fun to share this little tidbit with your loved ones. Keep cozy warm at the baseball game on a chilly spring night all wrapped all up in one of this really cool personalized vintage baseball throw blanket. Great Baseball gifts idea for that very special person. Personalized Vintage Baseball Throw Pillows, the perfect baseball gift. Personalized Vintage Baseball Throw Pillows for Guys, the perfect gift for any occasion. Vintage Baseball Blanket, makes the perfect Baseball gifts for kids that keeps them warm at the game or adding a nice touch to their baseball bedroom décor, both for boys and men. Baseball Themed Bedrooms for Boys, a great gift for that very special occasion. Baseball Man Cave Gifts and Teenagers and older boys will love these cool looking old dirty baseball pillows in their bedroom for the coolest Baseball gifts. Mix and Match baseball throw pillows and blankets. Have the pillow customized for that very special individual with one of these Personalized Vintage Baseball Throw Pillows for Guys. 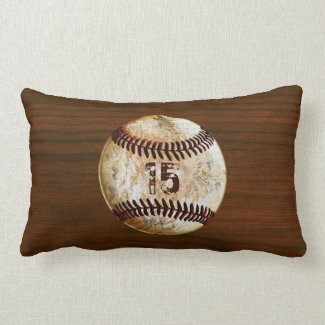 Customizable Round faux Vintage Baseball Pillows. Baseball Throw Pillows, the perfect Baseball gifts idea. Look at this dirty old baseball pillow in the round shape or check out the other round baseball pillows with your NAME or your Jersey Number (MONOGRAM) or TEXT. A set of these cool sports pillows will make any man cave or vintage baseball room for boys all the more cool and personalized. What an outstanding gift for that special sports lover. Vintage Baseball Decorating Ideas that will make a very special Birthday Gift or for any occasion. CALL Rod or Linda if you would like us to design one with your Name, Jersey Number or any special text just for you. Personalized Vintage Baseball Throw Pillows for Guys, the perfect Baseball gift. Round Baseball Throw Pillows, makes the perfect Baseball Christmas Gifts for men and boys and it will be very exciting to open and keep as a memory. Vintage baseball gifts are one of my all time favorite custom sports designs. The ideal gift idea for Valentine’s day, birthday or any occasion. Personalized Vintage Baseball Throw Pillows for Guys. I love the almost fossil stone like look of the old dirty baseball. These are some of the coolest looking new round vintage baseball pillows make Amazing Baseball Team Gift Ideas. I created a darker more rustic dirty stone like vintage baseball design. You can type in Your Name, Jersey Number and/or any Text you like. These are two different pillows. If you would like me to make ONE vintage baseball pillow with both your Name and Jersey Number on the front and or back. CALL Linda or Rod at: 239-949-9090. Vintage Baseball Decorating Tips, keep the main colors neutral and soft or the brighter blues and reds a bit grayer. Notice in the photo below that all of the colors have a softer grayer tone. You can achieve this by adding a tiny bit of black tint. Have your local paint store create a color and keep the lid with the paint color and information of the paint color on it too. (Completely Dry out the paint on the lid and put it away in a large zipper plastic bag). You want to avoid bright primary colors. I like having the main walls and floors a soft neutral tans and gray tones and use your vintage baseball accessories for bedroom as your accent colors. This will make changing the decor down the road easier too. I found this photo at Houz. I love total feel of this vintage baseball bedroom. Personalized Vintage Baseball Throw Pillows for Guys, the perfect Baseball gifts. Hang posters of old time players and teams, proudly display old dirty baseball or several in a jar or on the shelf. Paint your accent colors in deep dusty reds, blues and tans or your favorite vintage baseball colors. Personalized Vintage Baseball Throw Pillows for Guys. Have fun decorating with your son in his own vintage baseball decor. Add our Vintage Baseball Throw Pillows and Baseball Blankets to your room and give it that cozy look and feel. When my son was 8 years old, he picked out the 3 wall papers with a sports theme and he decided where the main wall paper would go, the accent paper and the border. It was so cool and creative, I felt like sending a picture to Better Homes and Garden magazine. If your son has fun with it, he will learn a lot and you will see if he has a knack for decorating. To this day, my son has a cool decorating style but it isn’t a main interest of his. Personalized rustic old baseball designs were created for Teenagers and Men or older boys. They will love the brown tones and the old almost stone like appearance. One of the personalized vintage baseball throw pillows would look great on this bed. Personalized Vintage Baseball Throw Pillows for Guys. 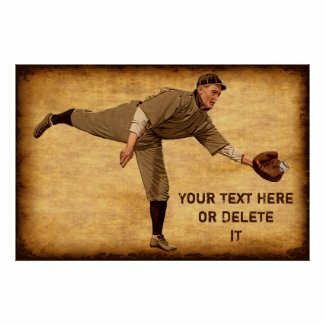 Finish off your cool vintage baseball room decor with this vintage baseball poster on faux antique paper and vintage baseball player. Available in many different sizes and paper quality from Cheap Baseball Posters to moderately priced. Makes a Great Baseball Birthday Gift or for that very special Baseball fan. Add this to your vintage baseball man cave decor for that warm rustic feel. Frames are available at an extra cost. Notice how all of the colors are more muted and have a grayer tone. This creates a handsome vintage baseball bedroom for boys and men that they will be proud of. Cherry or Walnut Wood look background sets our vintage baseball off. Lumbar pillow for support and vintage baseball decor. This will look great in his vintage baseball room or baseball man cave for guys that love the game. Baseball bedroom décor, makes the perfect Baseball gift that has Vintage Baseball Decorating Ideas. Notice how the Reds, Blues, Greens are darker with a gray tone too it. Not bright like you see with a lot of modern day baseball decor. To achieve these colors, you can add a tiny black tint to your basic primary colors. A little goes a long way. You can always add more black tint but you can’t remove it once it is in there without a bigger deal. Makes the perfect Baseball gift ideas. Personalized Vintage Baseball Throw Pillows for Guys, makes the perfect Baseball Gifts. I really love and enjoy the rich warm tones of vintage baseball decor. They are calming and guys will love it too. It is masculine and calming. Great for the vintage baseball man cave ideas. Add some old worn out dirty baseballs, shoes and vintage toys. How about some vintage baseball posters too. It is endless what you can do. The colors are so easy to decorate with too. Easy going vintage baseball bedroom for boys and for a very cool baseball man cave. Special Baseball Stuff for Kids, the perfect Baseball Gifts for Baseball lovers. Personalized Vintage Baseball Throw Pillows for Guys. Get your children involved in decorating their new old vintage baseball room. They will learn so much valuable information that they will use for the rest of their lives. Most schools don’t teach how to coordinate. They will be able to carry this into their personal and professional lives. It will help them put their clothes together for sharp outfits. Our Great for your Vintage Baseball Man Cave Decor. Personalized Vintage Baseball Throw Pillows for Guys, makes a great Baseball Gifts. CALL Linda or Rodney if you would like any changes. You can Delete and Add Text, Photos and more. Call Linda or Rod: 239-949-9090. Unique colors for their vintage baseball room would be deep or dusty red tones, neutral tans and grays from soft to bold. Blue with gray undertones and deeper Greens. If you think of colors with a Dusty Gray softness, that should work nicely. Mix and match the designs incorporating old baseball players, bats and balls and old rugged looking posters. Black and white photos would be fun too. How about adding some vintage toys with a baseball theme or other old toys and decor to complete the look. This is our Dirtiest Dirty Old Baseball Pillow. It looks like it was dragged through the mud. We can help you add your name or other text to these dirty baseball throw pillow, blankets and other dirty baseball decorating ideas and gifts. If you want a Grunge Baseball Pillow that looks really dirty, here is one designed in my wife, Little Linda Pinda shop. If you see ANY of our designs that you would like on a Zazzle merchandise or if you would like Linda to make any changes to any designs. CALL or TEXT Linda at: 239-949-9090 or Click our Contact Image above to email her. Calling is fastest and best way to get a hold of Linda. Thank you for stopping by and looking at our Vintage Baseball Throw Pillows and Blankets to create really cool baseball bedding and vintage baseball room. Thank you for visiting our vintage baseball decor article. 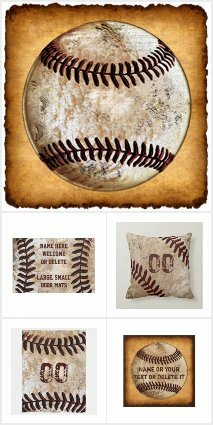 CALL us at: 239-949-9090 if you would like us to make any changes to the designs on the baseball throw pillows, baseball blankets or any of the Zazzle merchandise we design. Best Baseball Team Gift Ideas for a memory they will never forget. He will have the coolest baseball man cave around. Subscribe to "Your Sports Gifts" to see the newest Unique Sports Gifts personalized and customized just for you. Quality Gifts at Affordable Prices. © 2019 YourSportsGifts.com. All Rights Reserved.